How Making Peace Became an Instrument of War. The last 20 years have seen a fundamental shift in peace-making and peace-building. It’s pretty big, of course controversial, and it’s not getting much attention. The one-liner is that making and building peace have gone from being a humanitarian concern to part and parcel of how war is waged. It is the result of a securitisation process that started after the fall of the Berlin Wall in 1989; intelligence services of most major powers saw that traditional methods fell short when it came to understanding the emerging threat of intra-state civil conflict. Several other developments followed, which are outlined below, that have securitised peace to the extent of it becoming an instrument of war. Before going any further, there is an assumption that underpins this think-piece and which needs some elaboration. And that is a commonly shared belief that peace-making and peace-building are (among many) soft power instruments. “Soft power” is a term coined by Joseph Nye in the 1980s, which is “the ability of a country to persuade others to do what it wants without force or coercion”. Many who have read Nye’s 1990 book, “Bound to Lead: The Changing Nature of American Power” will recognise that the notion of “soft power” goes back by about 2400 years to Sun Tzu’s Art of War, making where we’re now at perhaps unsurprising. The evidence of how these particular instruments are part of soft power is seen in the foreign policy of several countries, including my own (Norway), where peace-making and peace-building are integral to the projection of foreign policy influence. So what are the threads that have led to the entanglement of peace work into war-making? The first thread, as mentioned, started with the fall of the Berlin Wall in 1989. The collapse of the Soviet Union and bipolar order saw a rise in civil conflicts across the world, including the Yugoslav wars (1991-2001), Somali war (1991-today), Georgian civil war (1991-1993), Rwandan civil war (1990-1994), and Chechen wars (1994-1996 and 1999-2009), to mention but a few. Intelligence services and military in the West and former Soviet republics realised that Cold War intelligence methods were inadequate to understand the dynamics of these conflicts. They became increasingly interested in (and wary of) the work of NGOs and universities involved in conflict early warning (part of the peace-building toolbox). Organisations such as Forum on Early Warning and Early Response (FEWER) were approached by intelligence agencies and had their activities monitored. There were several direct collaboration initiatives between intelligence and (particularly US) academia, including the State Failure Task Force (later Political Instability Task Force). 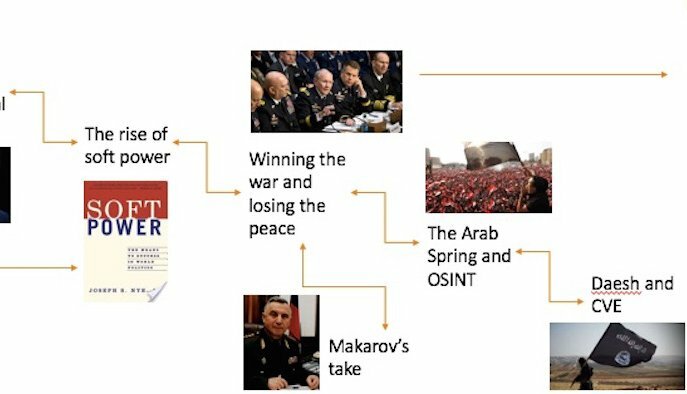 This work was part of what led to the rise of Open Source Intelligence (the securitised twin of conflict early warning) (OSINT); an important tool in governmental efforts to monitor and analyse civil conflicts and a strategic addition (initially) to traditional intelligence gathering. The second thread followed 9/11 and the invasions of Afghanistan and Iraq. While the initial toppling of the Taliban and defeat of Sadam Hussein’s military forces was swift, Allied forces quickly began to lose the peace. “Winning hearts and minds” became an important element in the battle for stability and Allied strategists turned to soft power for answers. A key soft power instrument became Provincial Reconstruction Teams (PRTs). First deployed in Afghanistan in 2001 by the United States government, PRTs consist of military officers, diplomats, and reconstruction experts, who work to support reconstruction and stabilise in unstable areas. PRTs (also known as stabilisation teams) were later deployed to Iraq and carried out activities that are typically seen in peace-building and conflict-sensitive area-based development projects. The main difference being that PRT activities are carried out in conjunction with military forces and aligned to military objectives. A close association was formed, therefore, between developmental actors, peace-builders, and humanitarian workers – who were doing PRT work – and perceived (and actual) occupying forces in the eyes of the population and insurgents. Some of the many challenges that emerge from the alignment of peace work to military objectives surfaced in a small perception survey conducted in 2012 byMona Chalabi, one of our talented ECAS Junior Associates at the time, across several governorates in Iraq. It was focused on ordinary Iraqi’s experiences of stabilisation. Among her findings was a perception by a majority of respondents that the greatest personal security threat during the occupation was posed by Allied forces, not by insurgents. That finding raises the question of how effective you can be in bringing sustainable peace and security to an area when you are seen as the principal threat; doing what some bluntly refer to “peace-building at gunpoint”. Related to this is a compromise on neutrality and the view of some insurgent groups and governments that organisations involved in peace-building and reconstruction are extensions of hostile soft power, and therefore legitimate military targets. The third thread emerged with the colour revolutions in former Soviet republics and was strengthened by the Arab Spring. The significance of the Rose Revolution (Georgia, 2003), Orange Revolution (Ukraine, 2005), Pink Revolution (Kyrgyzstan, 2005), and social upheaval in several other former Soviet republics was of course not lost on Russia. Inspired, some will say by the work ofGene Sharpe on non-violent resistance, the colour revolutions prompted Russian military strategists to develop what is known as the Makarov Doctrine (see more about this below), and the Russian state to develop methods to manage “street politics” and tighten control of foreign funded civil society groups in Russia. The Arab Spring (2010-2012) that came after the colour revolutions, saw the extensive use of social media to plan and execute demonstrations, thwart government counter-measures, and sway public opinion. It is seen by many in intelligence, diplomatic and military circles as the time when OSINT (conflict early warning’s securitised twin mentioned above) shifted from a strategic addition to traditional intelligence, to become an important tactical and operational tool. The events in Tunisia, Egypt, Libya, and Yemen showed that it had become possible to follow and support popular revolt in real time and by remote with tactically relevant information (e.g. how to counter the use of aerial surveillance of gatherings by burning tires). The hard power applications of soft power instruments came sharply into focus. The final and most recent thread was the execution of Russian hybrid warfare strategy (the Makarov Doctrine) in Crimea and Eastern Ukraine. In February 2010, President Dmitry Medvedev signed what was later referred to as the Makarov Doctrine (named after former Chief of the General Staff Army-General Nikolai Makarov) otherwise known as Russia’s hybrid warfare (or non-linear warfare) strategy. Explained by Makarov’s successor, Valery Gerasimov, “a perfectly thriving state can, in a matter of months or even days, be transformed into an arena of fierce armed conflict, become a victim of foreign intervention, and sink into a web of chaos, humanitarian catastrophe, and civil war.” This, he said, could be done by combining “political, economic, informational, humanitarian”, and other soft power instruments with “the protest potential of the population”. Some will say that the strategy was executed by Russia in Crimea in 2014, leading to the annexation of the peninsula without any major military confrontation, and followed by the destabilisation of the Donbass region in eastern Ukraine. Whereas Western soft power use in Afghanistan and Iraq was focused on winning the peace after military confrontation, Russian innovation was the deployment of soft power instruments from the very beginning and throughout a military campaign to great effect. And herein lies the fundamental challenge. These soft power instruments (political, economic, informational, humanitarian) now used for war-making are also at the core of the peace-making and peace-building toolbox. So there. That is the story, then, of how the securitisation of peace happened, and how making and building of peace is increasingly becoming an instrument of war. For those involved in peace work, the key question is now how we do our work when our methods are also used to wage war? So what’s the photograph? It is a snapshot of a slide from a presentation we recently gave to Chinese policy makers and think tanks on the securitisation of conflict prevention. It was the conclusion of a UK-China dialogue on conflict prevention, organised by Saferworld, and funded by the UK’s Department for International Development. It summarises the seven threads (yes – there are three more) that got making peace entangled with waging war. If you want to learn more about the photograph, the other three threads, or our work, just get in touch. Solenn Delesvaux, Teacher of French as a foreign language in Phnom Penh, Cambodia. It was last September. Sitting on the edge of the stage, small, bearded, his two bare feet hanging in space in the front of a crowded screening room, Rithy Panh was answering the public after the projection of his last movie, The Missing Picture. Pictures indeed lack to point the horror that involved every family of the country during the days the Angkar (the Red Khmers’ regime) made disappear one person out of five for the sake of a society pictured as agrarian between 1975 and 1979. There are only a few archived pictures left by the executioners, those of a rotten propaganda. The individual who is filming sometimes stays a little longer on a position, recording unwanted information, one of those that would have scratched the regime. These are the small nuggets Rithy Panh thoroughly looked for during his research at Bophana Centre, now showing these pictures chopped off by censorship, attesting a sort of resistance or perhaps awareness among the executioners. Small terra cotta characters are modeled, carved out then naively painted under the sight of a fixed camera. Figurines awake in the 60s surrounded by the sound of Khmer rock that Phnom Penh is nowadays trying to rehabilitate in one of the city’s bar (The Cloud). However, little by little as the characters cover themselves with black clothes, an outfit imposed by the regime, people fatefully start to disappear one after another in a succession of crossfading. Irremediably left alone, the young main character grabs his face with his hands, his eyes left wide open with horror. The story takes another dimension when, carefully wrapped in the storyteller’s bashfulness, we get to know the identity of the man who let himself starve to death or the identity of this young child who cries on her bench for hours before kissing the silence forever. We come closer to the director, moving on tip-toes. What should we think of these children denunciating their parents believing they were doing the right thing, mutating right away into executioners? What should we say about the scheduled disappearance of any familial ties? 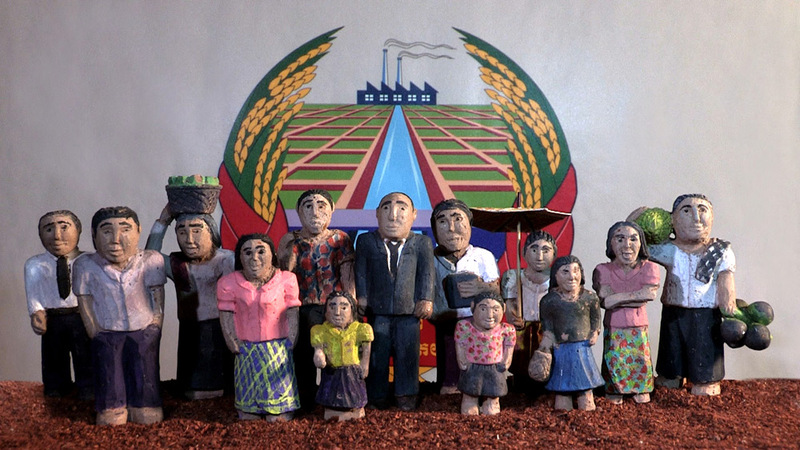 Rithy Panh gave birth to this movie for his people, both in a restraint and large meaning, for his loved ones slaughtered by the ideological machine as well as for the younger Cambodian generations confronted to their family’s silence, some people refusing to recall their memories on atrocities, others perhaps having too much to hide. The conference is leading to its end. The small man’s bare feet still swing with nonchalance; he looks terribly at ease in this intimidating position, sitting in front of nearly a hundred pairs of eyes. He confesses the picture he misses the most. It will be the picture of his two parents in an advanced age, by his side. France, Lebanon, Iraq, Nigeria and Mali experienced devastating terrorist attacks this month; 130 dead in France, 41 in Beirut, 26 in Bagdad, 9 in Maiduguri, and 19 victims in Bamako. Hollande’s declaration of war on Daesh and extremist groups in the Sahel means an intensification of on-going French military operations, alongside those of the US, UK, their allies in the Middle East, and Russia. Civilian fatalities from these operations are also high (for example, about 2,500 civilian fatalities since Saudi Arabia started its airstrikes and operations in Yemen; the deaths of “thousands of civilians” from Russia’s bombing campaign in Syria) and bound to breed more misery and hatred. Many peacemakers are calling for restraint after the Paris attacks and for a formulation by our leaders of a vision for Europe that is united in its diversity.Others urge the many communities that make up Europe to instigate and promote a culture of peace from within and actively reach to others across religious, social, and ethnic divides. This is indeed important and must be part of a European (and Lebanese, Iraqi, Malian, Nigerian) peace-making agenda. However, a focus on a culture of peace and bridging divides is not enough and peacemakers may need to engage political leaders more robustly on the on-going military counter-terrorism response. We should also pick up the search mirror and understand how some of the profound ongoing changes in warfare and violent conflict will affect the effectiveness of peace-making at a global level in the years to come. Let’s start with Hollande’s declaration of war against Daesh. If the aim of this war is to reduce terrorist threats to civilian populations around the world, then consider what such war really entails. These days fatalities from war, of course, are mostly civilian – so de facto, you’re killing civilians to protect civilians, which is nonsensical and shameful. But that aside, it is also counter-productive because destabilised and war-affected countries are easy places to run and grow armed (political, criminal, extremist – you name it) groups. War is destabilising and war-affected countries tend to be unstable for a long time; most countries at war today are so because they were at war in the past. So waging war as we are doing in Syria and other places is not threat-reducing, it is more of a long-term threat-multiplying strategy. There is surprisingly little to be heard on this from (particularly Western) peace-making and peace-building organisations. Now for two other on-going tectonic shifts that will fundamentally affect the effectiveness of peace-making over the next few years. Both are discussed in greater depth in a report I recently wrote for Saferworld, a forward-thinking peace-building NGO in the United Kingdom. The first is that the tools of making peace are well on their way to becoming instruments of war. In an article for Russian defence journal VPK, General Valery Gerasimov (Chief of the General Staff of the Russian Armed Forces) wrote in early 2013 that war and peace are becoming more blurred and“methods of conflict [now involve] the broad use of political, economic, informational, humanitarian and other non-military measures”. Unlike NATO and Western efforts in Afghanistan and Iraq to “win hearts and minds” and “win the peace” after the invasions there, Russia has successfully deployed the soft power toolbox in Ukraine before troops were deployed and then throughout hostilities. As this approach to warfare gains further traction, the dilemma for peacemakers is critical; how do you make peace in contexts when the tools you typically use to do so are part of a war-making effort? The second is that the nature of war has changed and we’re now dealing with ‘hybrid conflicts’. In a simple review of 53 countries affected by widespread societal violence (i.e. different levels of violent conflict), I found that 35% (19) of them were affected by three or more forms of (often inter-connected) violent conflict: political, criminalised, extremist, and/or environmental and climate change driven. I define these “hybrid conflicts” in the Saferworld paper as “violent conflicts or situations of widespread violence where elements of grievance, greed, and/or extremism are intertwined – and where climate changes may play a role”. Why is this important? Well, there are significant differences, to oversimplify, between making peace between opposing groups that are mainly motivated by political aims, and doing so between criminal groups driven by financial interest. We certainly are not equipped to do the latter, let alone do so well when group identities and motivations (and conflict issues) are even more mixed up. What this means is that in the absence of (or willingness to) influence, peacemakers have to prepare for the knock-on effects of military responses to acts of terror, look hard at the successful execution of hybrid warfare strategy and the rise of hybrid conflicts, and re-think how we go about our work. So what’s the photograph? 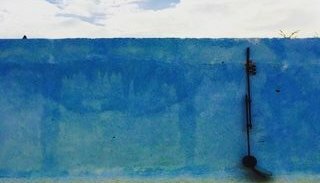 It is a recent picture of a search mirror (used when poking your head over the compound wall is ill-advised) by one of our good friends, Peter Albrecht, during his time in Garowe (Puntland, Somalia). We like it as it conveys the current posture of peace support operations in hybrid conflict areas and of many of today’s peacemakers in relation to intensified military action in countries affected by religious extremism. Aside from being a great photographer, Peter writes insightful analysis and you can access some of his recent thinking on peace-keeping in Somalia in DIIS policy briefs. If you want to learn more about the photograph or our work, just get in touch with Peter or myself. David Nyheim, Chief Executive of ECAS and Managing Partner and Chairman of INCAS Consulting Ltd. (Malta), has mentioned the name of Artraker in a report he wrote for a project on conflict prevention. This project “aims to stimulate debate on this topic and to provide the international community with food for thought about the future of early warning systems”. As part of a project designed to facilitate dialogue on conflict prevention between China and the UK, Saferworld’s Conflict Prevention Working Group (CPWG) have been examining different approaches to conflict prevention, including upstream conflict prevention, crisis response and early warning. Within China, experience and knowledge relating to early warning is comparatively undeveloped, yet it is an emerging area in which China is expressing increasing interest. For this reason, the CPWG has begun to explore whether and how early warning systems might act as an entry through which China-UK dialogue and cooperation on conflict prevention could focus. The author suggests why we need to question the effectiveness of current early warning and response systems, and proposes recommendations for how these vital instruments and mechanisms can be strengthened. The Afterword, by Dr Xue Lei, addresses the prospect for China-UK cooperation in early warning, and conflict prevention more broadly, and outlines some of the different levels at which China-UK cooperation could take place. It acknowledges that whilst this form of partnership would not be without obstacles, the two countries would benefit from working together towards shared goals for peace and stability.